Blade Runner 2049. The first one is set in 2019 so it makes sense in that regard, even if it's not the most exciting title. More interesting in this little announcement is the accompanying set photo: or something within the photo. The main focus is understandably on those involved; director Denis Villeneuve, producer Ridley Scott, and actors Harrison Ford and Ryan Gosling. It doesn't spike the heartrate like earlier concept art, but it does include a tidbit that ties it into the first movie. Take a look on the counter in the picture. The presence of those iconic firearms is a nice touch. 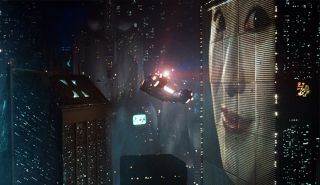 It also gives us a smidgen of info on how the world of Blade Runner has changed in the 30 years that's passed since the first film. Or hasn't as the case may be. The fact that someone is still using these blasters means either one of two things; they remain standard issue for runners OR Deckard's hung onto his as mementoes. Directed by Denis Villeneuve and starring Ryan Gosling, Robin Wright, Dave Bautista, Jared Leto, Mackenzie Davis, Barkhad Abdi, and Harrison Ford, Blade Runner 2 will be released in cinemas on October 6, 2017.